Turbulence (or seeing) is a great concern when recording images of the sky, because this is jeopardizing astronomical telescope resolution. Recording images during best seeing is really a big advantage, to do so, continuous seeing measurement is required to optimize image recording time. 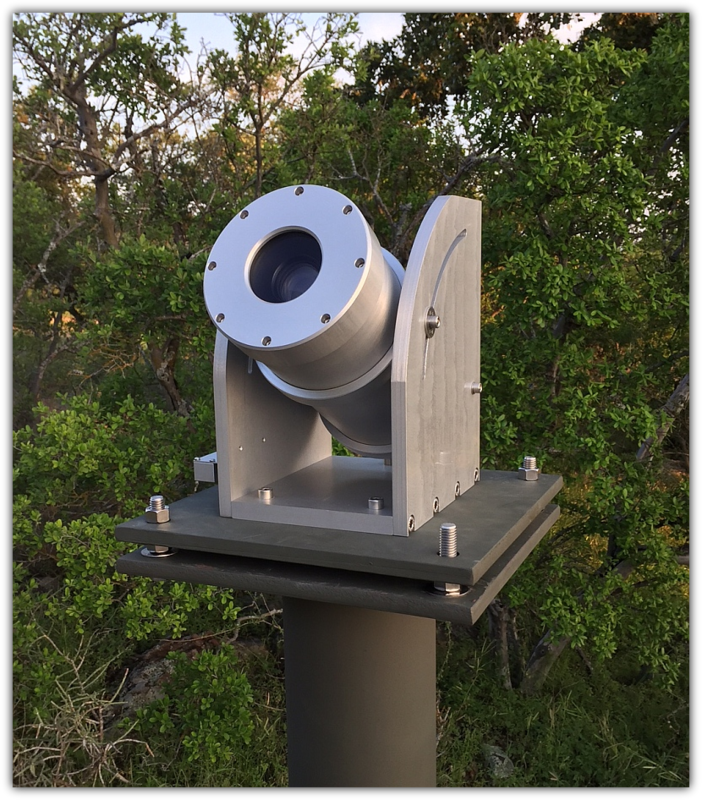 To get seeing measurements, the DIMM method is mostly used by professionnal observatories in order to measure atmospheric seeing (or turbulence) and allowing to optimize targets and observation programs. 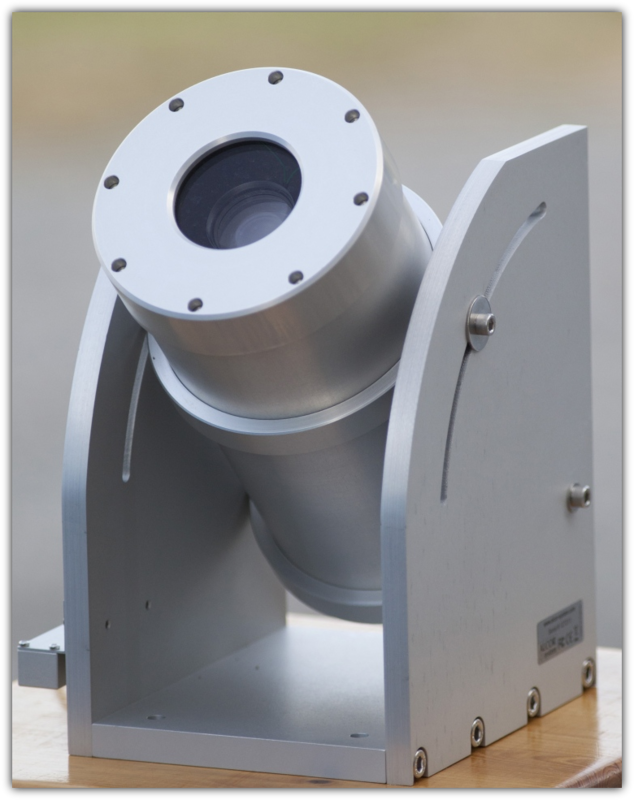 Nevertheless, DIMM method requires a telescope with enough focal length (>3000mm) and enough aperture (>250mm), and to track bright stars the whole night. This is quite stringent and can be a quite costly approach. The telescope needs a shelter, and automatically jump from a star to another. ALCOR-SYSTEM provides a method to overcome some of the drawbacks of the DIMM system. In the northern hemisphere, a bright star called "polaris" that does not move so much in the sky and is bright enough. 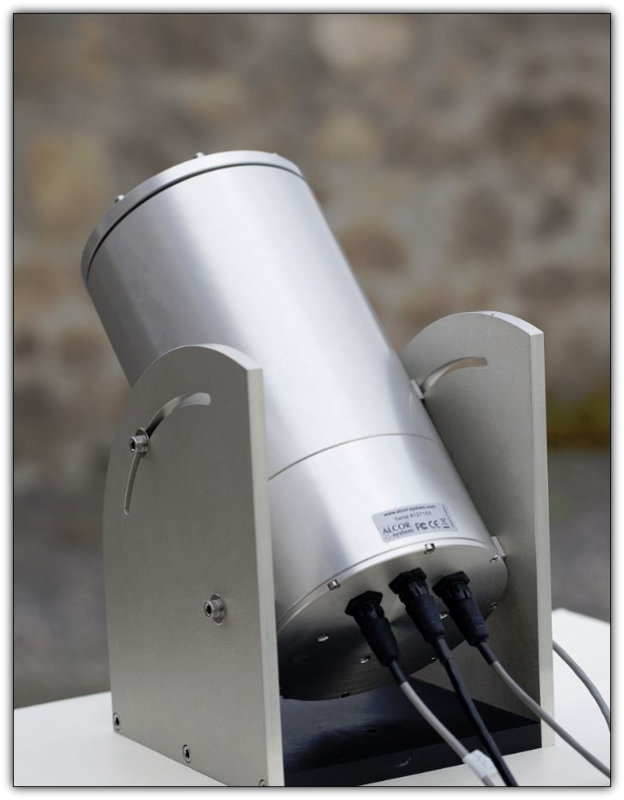 The goal of this product is to measure atmospheric seeing condition in a continuous fashion, so this setup stays outdoor all the time 24h a day, and is aimed at the polaris star in a fixed fashion. This system can only work in the northern hemisphere, at latitudes above 15° North, for southern hemisphere please contact us for solutions. 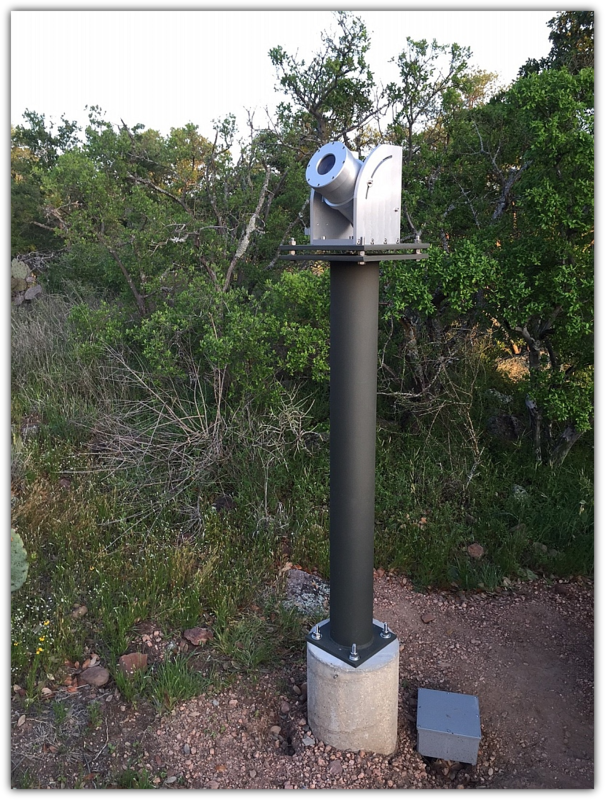 The fixed seeing monitor is a totally sealed system that can overcome all extreme weather conditions, and is not sensitive to wind gust due to its strong design. 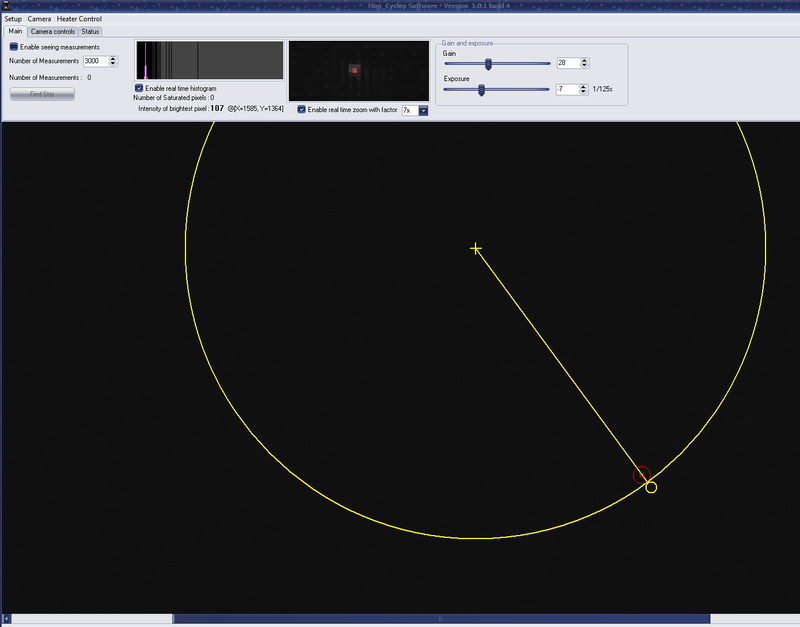 The software starts measurements automatically when the Sun is below the horizon and only when the stars are visible. The system has four temperature sensors and two humidity sensors so that warming up of the entrance window is automatic (to prevent dew from forming), and also controls the cooling of the seeing detector. - ability to measure very low seeing figure, whereas other systems are not reliable under 1.5 arcsec. This system offers watertight connectors, for continuous outdoor operation. The line of sight can be adjusted accurately to aim at polaris star. Once this is performed, there is no need to carry out any further adjustements. The system is made of high quality alloy colorless anodized aluminum. The software is embedded to this system. We have Windows software, for Linux, please ask us. 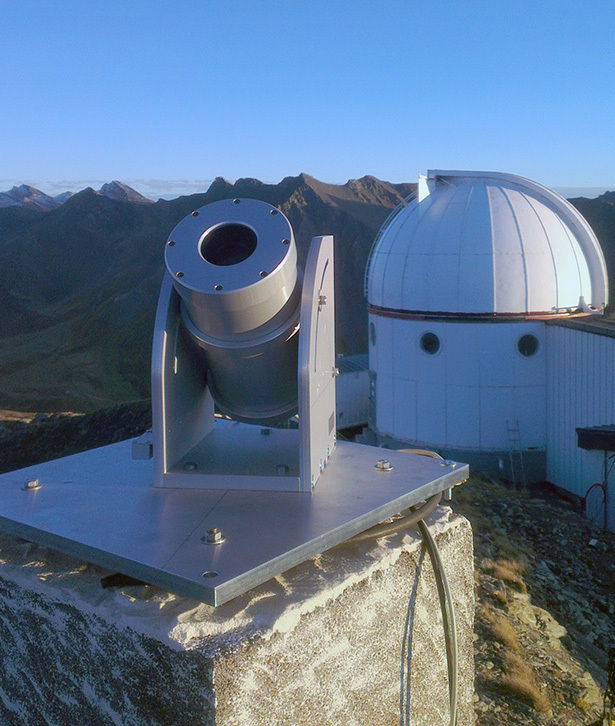 The field of view of the system is 3.6° x 2.5° and perfectly accomodates the polaris star path throughout the whole night / whole year, so that continuous measurements can be performed. Since the image recording is performed continuously, it can provide a figure of seeing expressed in arcsec (or Fried's Ro) in a continuous matter, if weather conditions allows. In order to prove that this concept is working in a reliable fashion, it has been compared with other systems, at the same time and the same place. Another test consisted in using a Ritchey Chretien 250 mm F8 telescope, with a standard scientific sony ccd camera, and a pixel scale of 0.35 arcsec per pixel. 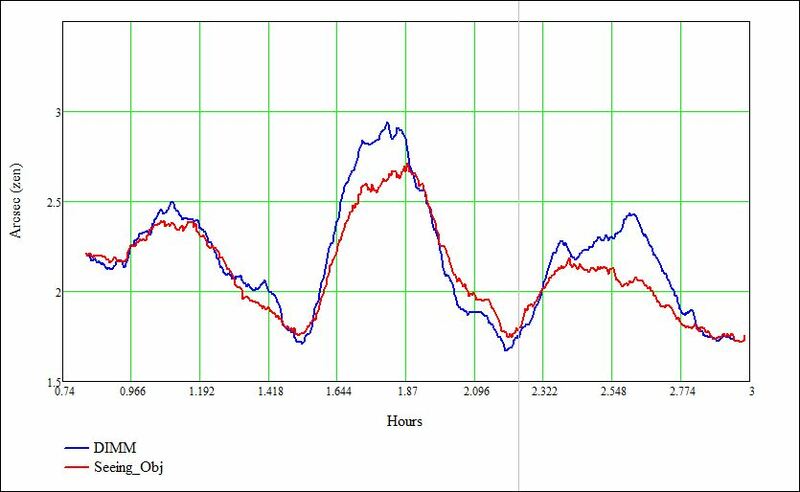 The exposure time was 5 sec, and unsaturated star FWHM was measured on both star axis. The selected star was always close to zenith. The red dots are the star FWHM over the time from the RC telescope. The black dots are from the cyclop apparatus, and shows very good agreement with the telescope measurements. To check out the validity of the data that comes out from this apparatus, this system has been compared with another seeing system called DIMM, used in most professionnal observatories. Systems were located few meters appart. 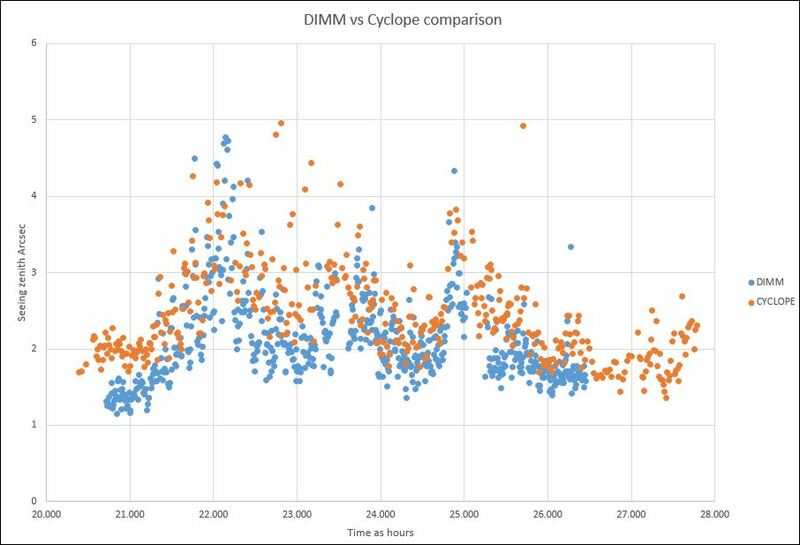 Here are the results, the blue line is from the DIMM and the red line from the fixed seeing monitor.The agreement between these two plots is very good, so the data coming out from the fixed seeing monitor can be regarded as reliable. In all tests we did, the cyclope results could never be defeated or compromized by any other measurements. The system has been running flawlessly since Sept 2015. 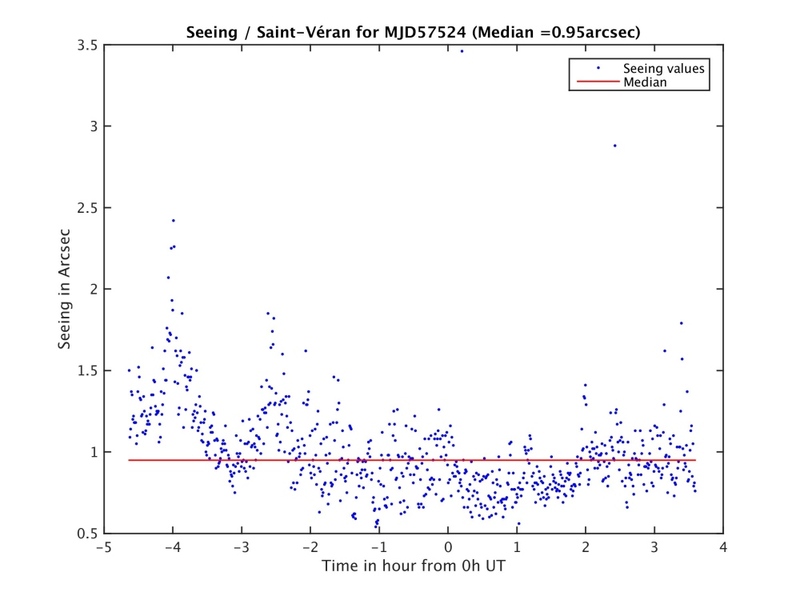 Some data of a night shows seeing figures lower than 1 arcsec, and even lower, reaching almost 0.5 arcsec ! A Cyclope was installed in the south est of the USA, running 24h a day. All data and images are courtesy from Ken Kattner and Putnam Moutain Observatory. A last comparison with 10" DIMM system, carried out in July 2016. This is very close, and some difference is visible because polaris star and a star in cygnus constellation has been used, so the optical atmospheric path is not exactly the same. Atmospheric turbulence, Jet stream localization, passive optical sensing. Atmospheric turbulence for remote sensing. This product can be combined with our all Sky cameras.